We arrive at dawn on the island of Java in Indonesia, in Yogyakarta more precisely, at the heart of Javanese traditional culture and classical arts. We weave in between the cars and mopeds to escape the hustle and bustle of the town and head off towards the tropical forest at the heart of the island. 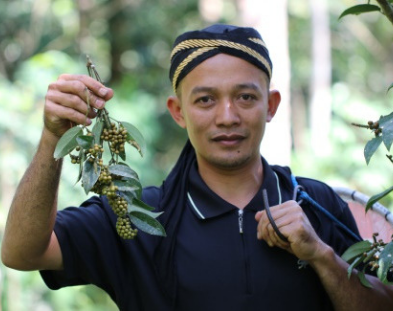 Dewi and Solehan have invited us to join them during the month of June in the midst of the Cubeb pepper harvesting period which they organise with five communities who have come to pick the pepper: the Kemukus pickers. Even before we enter the forest, we are amazed by the fascination surrounding this magical pepper. The pepper production, if we can really call it that, is totally wild and the picking areas are probably the island’s best-kept secret. Dewi and Solehan ask us to keep the names of these areas totally secret. We take an oath of silence, never to reveal these greatly sought-after places, and head into the forest. All signs of urban life are left behind as we go ever deeper into this dense and luxuriant forest. What an extraordinary change of scene. Then we come upon the magnificent sight of these Cubeb pepper vines, winding up as high as 10 metres. Some are over 25 years old. Solehan explains how the richest drupes grow at the very tops of the vines where the sunlight is the most intense and the ecosystem the most fertile. To capture these rare delights, the pickers clamber agilely to the treetops and pick the reddening ripe peppercorns. 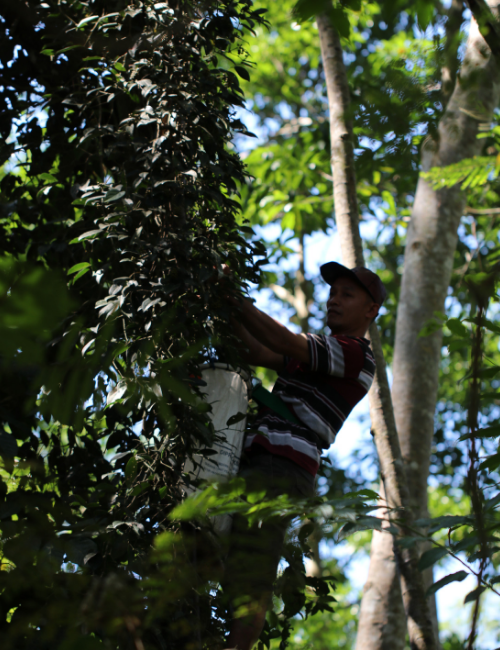 As he puts on his harness, Solehan tells us that “The pepper pickers are as fearless as tightrope walkers”. With the sheer strength of his arms, he embarks on a long and arduous ascent. We can’t take our eyes off him, holding our breath as he climbs higher and higher. We can no longer see the ropes and harness, it’s almost as if he’s not attached at all, flying ever higher. And then, at the end of the month of June, the men return to the village with their pepper. Each tree produces on average around 50kg of fresh pepper and the next harvest will have to wait until the following year. Then it’s time for the drying and sorting phase. 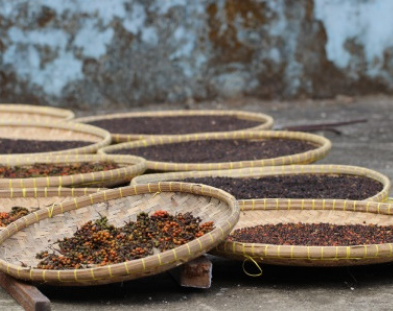 The local women carefully place the peppercorns on sieves made from bamboo which are left out to dry in the sun for 3 to 4 days. The water evaporates naturally, the aromas develop and the pericarp wrinkles then turns black. 4kg of fresh pepper make 1kg of dried pepper. Sorting Cubeb pepper is a long and dextrous process. The skilful hands carefully select the finest black peppercorns and remove any stems and smaller or less well-formed peppercorns. Cubeb pepper vines grow up the Rudraksha tree, the “eye of Shiva” (Rudra is another name for Shiva and Aksha means “eye” in sanskrit). Legend has it, that while meditating Shiva had a vision of the world’s desires and sufferings. Overcome with emotion, he started to cry and his tears of compassion fell to the ground. Where these tears fell, sprouted the tree up which Cubeb pepper vines would grow, a tree whose seeds are called “the tears of Shiva” or ” eye of Rudra”. In Hindu culture, the pearls of this tree have precious virtues and health benefits: they are used to treat many diseases, promote long and clear concentration, provide rare energetic qualities and favour meditation. Bracelets made out of these pearls are considered as sacred objects full of shakti (divine energy). 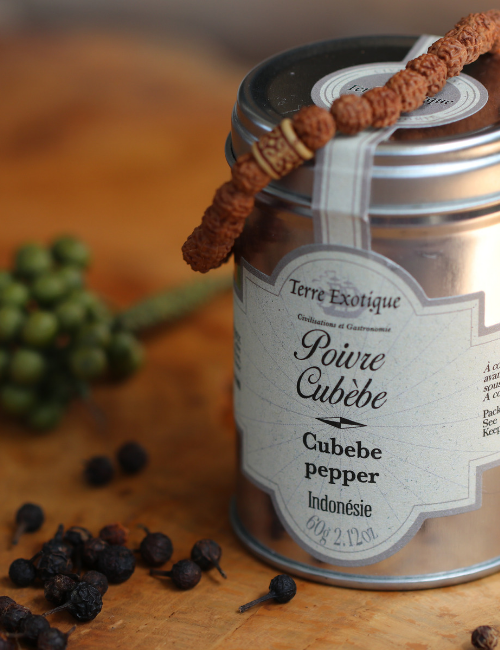 Cubeb pepper grows in the same region as Borobudur, the temple in the Kedu plain, a holy Javanese sanctuary due to the extreme fertility of the soil. 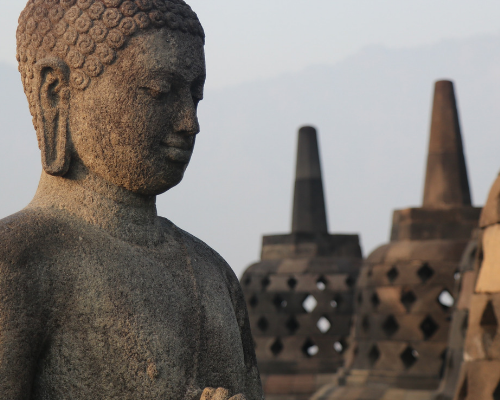 Borobudur is one of the world’s largest Buddhist monuments. It was built in the 8th and 9th centuries during the reign of the Shailendra dynasty. and the world of formlessness where we no longer see shape or form. This main monument is served by two other buildings, and each one illustrates the steps of the journey to Nirvana. Cubeb pepper is very important in Unani medicine. Unani medicine is a traditional Indian medicine dating back to Greco-Roman times and which is still used today in India, Pakistan, Bangladesh and Iran. Unani medicine has inherited elements from Ancient western texts (there are still signs today of precepts of Galen) and Arabic and Persian treaties, before becoming a major part of Indian medicine. In Unani medicine, Cubeb pepper is still used today. It has similar virtues to those of Arabic medicine in medieval times: it fortifies the vital organs, namely the stomach, and is widely used for digestive disorders. It is also highly recommended for taking care of teeth and gums.